An artist's conception of a stellar protoplanetary disk, where planet formation occurs. Planetformation is a story with a well-known beginning and end, but how its middleplays out has been an enigma to scientists?until now. A newcomputer-modeled theory shows how rocky boulders around infant stars team up toform planets without falling into stars. "Thishas been a stumbling block for 30 years," said Mordecai-Marc Mac Low, anastrophysicist at the American Museum of Natural History in New York City, ofplanet formation theories. "The reason is that boulders tend to fall intothe star in a celestial blink of an eye. Some mechanism had to be found toprevent them from being dragged into a star." Thesolution: Together, many boulders can join to fight a cosmic headwind thatotherwise would doom them. The stuffof rocky planets originates in an accretion disk, or collection of gas and dustthat circles around a newborn star. Over time the dust particlesbunch together and form large boulders, but eventually they meet"wind" resistance from the disk's mist of gas. "Theysee a headwind. It's deadly and drags them into the star," Mac Low told SPACE.com. Modelingthe turbulence within the gas, however, showed that boulders can team up andform planets. "Turbulencein the disk concentrates boulders in regions of higher pressure," Mac Lowsaid, noting that such a disturbance is enough to enable the boulders to fightthe dooming headwind. "If the gas is sped up, the boulders don't see aheadwind. By getting the gas going with them they conserve energy and stay inorbit." Mac Lowcompared the effect to a chain of semi-trucks driving down a highway. Eachboulder is like a semi-truck "pushing" the gas in front of it,creating a friendly pocket of air behind it that other semis can travel inwithout using up as much fuel. "The end of the story is that enoughboulders gather together, gravity takes over and they collapse into planet-likebodies," Mac Low said. Mac Low andhis colleagues' findings will be detailed in an upcoming issue of the journal Nature. AlthoughMac Low and his colleagues kept planet-forming boulders safe from thegravitational clutches of stars in their simulation, he noted that manyquestions remain. 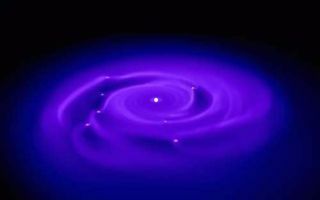 "Thereare enough uncertainties that [planet formation] is not going to be an openand shut case any time soon," he said. "We don't know how that collapseinto a planet actually occurs. You've got thousands, millions of bouldersswarming together like a bees. In my nightmares I imagine that they grind eachother down to dust and it all goes away." Despite theproblem, Mac Low is confident the theory will hold up to future scrutiny. "Allthat material is gravitationally bound together, so we think it's likely thatit will form large objects," he said. Running the computer simulation, infact, formed tight boulder clusters as large as the dwarf planetCeres (formerly known as the asteroid Ceres). Alan Boss,an astrophysicist with the Carnegie Institution in Washington, D.C., said that the theory is attractive despite the caveat. "Overall,the calculations present an encouraging approach to understanding how somethinghappened that we know must have happened, at least for the terrestrial planets,"Boss said in an e-mail. How giant planets form yet another question. One ideais that gas coalesces around a rocky, or terrestrial planet. Boss, however,thinks the gas giants collapsefrom a knot, much in the manner of star formation. Mac Low andhis team plan to address the mystery of how boulders collapse intoplanetesimals, or protoplanetary chunks of rock, in the future.